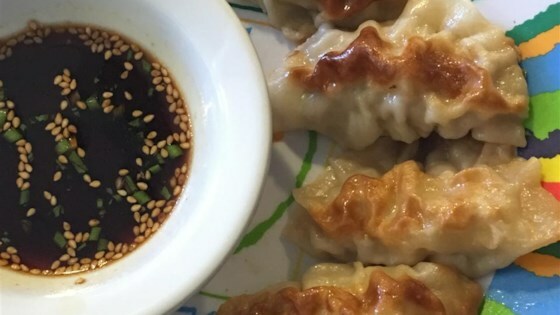 "In Seattle's International District, Liana Cafe House sells traditional Chinese pork dumplings from a tiny takeout shop. See how to make them at home." Combine 1/2 cup soy sauce, rice vinegar, 1 tablespoon chives, sesame seeds, and chile sauce in a small bowl. Set aside. Mix pork, garlic, egg, 2 tablespoons chives, soy sauce, sesame oil, and ginger in a large bowl until thoroughly combined. Place a dumpling wrapper on a lightly floured work surface and spoon about 1 tablespoon of the filling in the middle. Wet the edge with a little water and crimp together forming small pleats to seal the dumpling. Repeat with remaining dumpling wrappers and filling. Heat 1 to 2 tablespoons vegetable oil in a large skillet over medium-high heat. Place 8 to 10 dumplings in the pan and cook until browned, about 2 minutes per side. Pour in 1 cup of water, cover and cook until the dumplings are tender and the pork is cooked through, about 5 minutes. Repeat for remaining dumplings. Serve with soy sauce mixture for dipping. I cook them in water first during 6-8 minutes and when water has evaporated then a pour some oil and let them brown. I added some thinly chopped napa cabbage and water chestnuts in with the pork mixture. Reduced the amount of sesame seeds and added some honey to the dipping sauce.